Getting ready to get some shade this summer? If you’re looking for the best tanning lotion products on the market that will suit your budget and your needs, you’ve come to the right place. Millenium Dark Tanning Lotion’s New Paint It Black with auto-darkening feature is one of the best sellers on the market right now. Aside from providing customers with excellent results, it also comes at a very affordable price. Critics and all tanning enthusiasts out there agree that this tanner will give you bang for your buck. At the current pricing, you can take advantage of a tanning product that will not harm your skin and can give you that bronze glow you want. The best thing about this tanning lotion is that it’s suitable for all skin types, no matter what your age is. It doesn’t have any side effects or any tingling sensation. In fact, of the 1300 plus customers who rated it on Amazon, 55% gave it a 5-star rating. This New Paint It Black Tanning lotion from Millenium Tanning delivers the extreme dark bronze tanning results that you expect. Through its super luxurious silicone emulsion, you can experience ultra moisturization all day while keeping the dark tan color on. Some tanning lotions leave the skin dry and dehydrated. This can be bad for the skin because the skin cells need moisture to keep them alive. If the outermost layer of the skin loses moisture, cells begin to deteriorate and eventually die. Another thing about this lotion that most customers like is that, unlike the other lotions on the market, it isn’t watery and it has the consistency that can be expected from an average lotion. It’s easy to apply, and it works quicker than other products. The New Paint It Black tanning lotion has a sweet and sugary scent. The lotion actually smells like vanilla Ice cream, and what is even more awesome about it is that it smells the same, even after hours of use. The tanning lotion may be one of the best sellers in the market but it’s not as perfect as you wish it would be. There are still some drawbacks for this product. If you decide to put some sunscreen on, be sure to do it a couple hours before you actually get out in the sun. The sunscreen needs to really dry up so that the skin can still absorb the tanning lotion completely. Another noteworthy fact about this lotion is that it doesn’t work well if you put tanning oil on first. The best results would be attained if you use it SPF-free. That being said, it’s not recommended to stay outside the sun too long. A lot of people love the smell, but it can also be a deal breaker to others. After all, not everyone has the same fragrance preference. Some reviews mentioned that they didn’t like the scent because it was too sweet for their taste. A smart consumer wouldn’t miss to compare the products they’re interested in. It’s only practical to look at other products on the market to make sure that you got the best deal out of the one you purchased. Putting the Millenium Tanning New Paint It Black Auto-darkening Dark Tanning Lotion side by side with Tan Physics True Color Sunless Tanner, the most distinguishing characteristic would be the price. The latter is almost double the price of the New Paint It Black tanning lotion. Looking at Amazon ratings, this product is certainly superior. 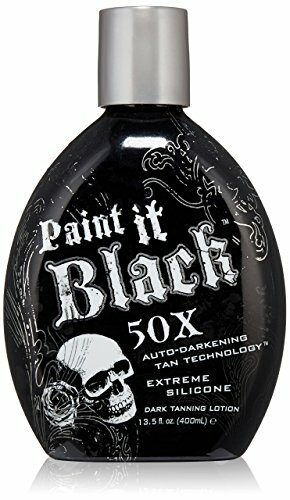 For tanning lotion that works as great as it does, it’s pretty safe to say that the Millenium Tanning New Paint It Black Auto-darkening Dark Tanning Lotion is a great bargain. One bottle contains 13.5 ounces of lotion, which would be good for as many as 15-20 full body uses. However, it wouldn’t be enough for the whole summer duration, especially if you’re out in the sun a lot. For a rating of 4.1 on Amazon out of 1300+ clients, you can say that a lot of customers are satisfied with this product. How can they not be? It’s super affordable; it delivers more than their expected results, and it smells really nice. It also works as two products: a tanning lotion and a moisturizer.